Flexitol Heel Balm from HealthyKin.com has a unique formula that contains 25% chemically synthesized Urea in a highly concentrated, moisturizing and emollient base to soften dry, cracked heels and feet. The combination of emollient ingredients actively replenishes moisture deep below the surface of the skin, promoting a visibly healthier skin in just three days application. In addition to its use for dry and cracked heels, Flexitol Heel Balm can be applied daily as a preventative moisturizer to help you keep your feet soft, smooth and supple. Flexitol Heel Balm is recommended on rough areas of the feet and potential blister sites before exercising. The running/walking movement will massage Flexitol Heel Balm into the skin, leaving your feet feeling smooth. 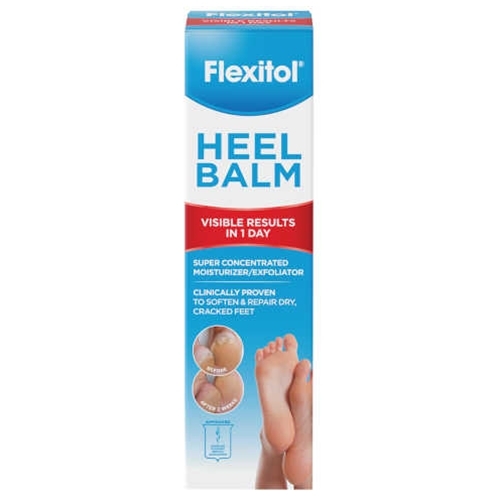 Flexitol Heel Balm is also very effective in helping to prevent blisters and friction on hard areas of the feet when 'breaking in' new shoes.